Recently I was looking for skin care lotion and body wash for my 2 year old since she has very sensitive skin. My sister suggested I try products from the Shea Moisture Baby Care line she received for review. I'm glad she did because while I didn't know about these products before, after using them I really like them and will look for them in stores. The range of Shea Moisture Baby Care products are must have's because it's safe and delicate on the skin, free of synthetic ingredients and great for all ages. My daughter loves all of them because the products smell great. I love not having to worry about unsafe ingredients on my daughters skin and the products keeps her skin soft and healthy. The first night I used the Raw Shea, Chamomile & Argan Baby Head-to-Toe Wash on my little one. I really like that the smell it's over bearing and the lather was nice and foamy. I didn't have to use half the bottle to get suds and it rinses off very easily. The extra bonus is the Chamomile has made bed time much easier and calmer. 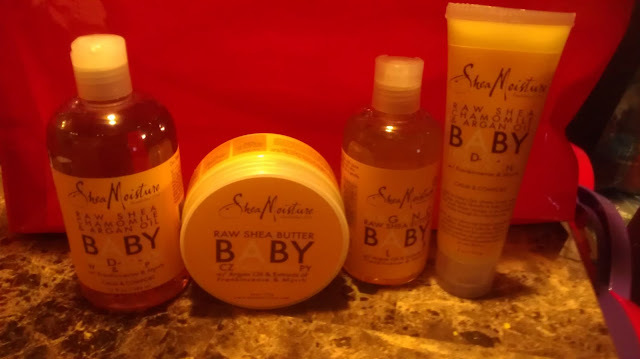 I will definitely use the Shea Moisture Baby Care line on my son when he is born. I would also recommend to my friends since the quality of the products are great and the price is reasonable.